When developing a template or custom layout, this is a great way to help everyone using the template with consistent formatting. 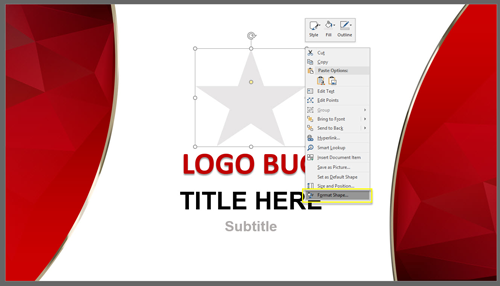 Go to the Master Slide or specific Master Layout and select the title text placeholder. 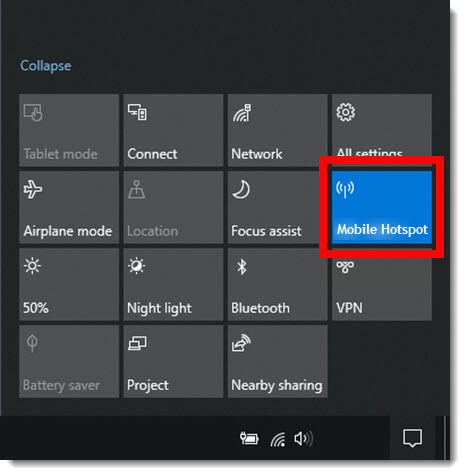 On the HOME tab, in the FONT section, click the FONT DIALOG icon. From the FONT dialog, check the ALL CAPS option, and OK.
That’s all the programming needed. That text placeholder will now be ALL CAPS text as it is added. 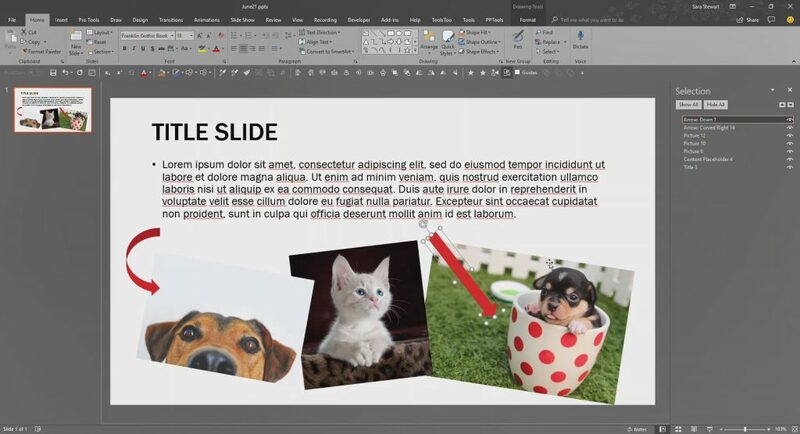 Funny things can happen to PowerPoint Master Layouts; we have found layouts susceptible mystery bullets being added to text placeholders, layouts jumbled, fonts not working and many other annoying format problems. The mystery can be unravelled by delving into the file XML files – or, we can hack the process by replacing the corrupt layout with a new version. 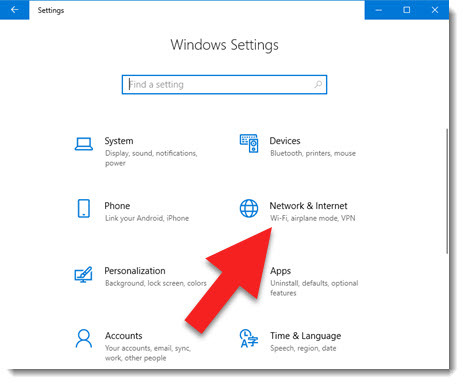 The really is no fixing a master layout that has gone bad. For this example we are saying the TITLE AND CONTENT Master Layout has become corrupt. 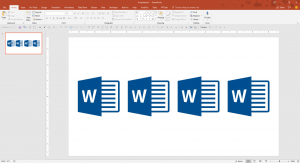 Our solution is deleting the bad layout and replacing with a fresh layout of the same name from another file, such as an earlier version of the same template, or from the Microsoft Default template. First, we need to delete the Master Layout, so all slides that are assigned to it need to be deleted or assigned to another Master Layout. Then Open the Master Slide view and delete the corrupt layout (which means the layout that has mystery formatting issues that cannot be resolved – it is XML corrupt). 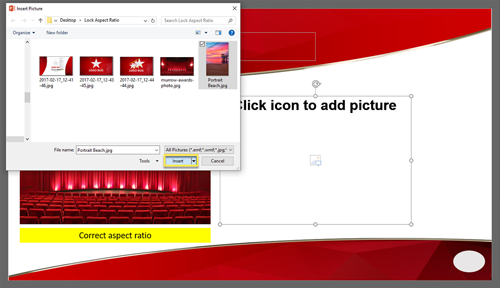 Now the hack, insert a new Slide Master by right clicking and selecting “INSERT SLIDE MASTER”. 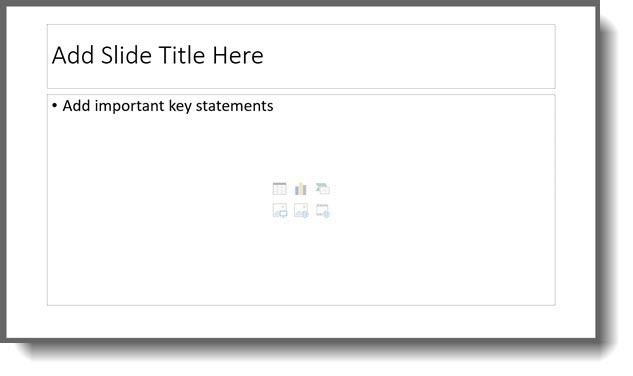 From the new Microsoft default Master Slide, find its TITLE AND CONTENT layout. Drag the fresh layout TITLE AND CONTENT layout from the new master to the original Master Slide to replace the corrupt layout deleted earlier. Note: the new master layout will pick up the Master Slide attributes, but it may need customization to match the template layout needs. The good news it has a fresh XML coding behind it and what was bad is now gone! 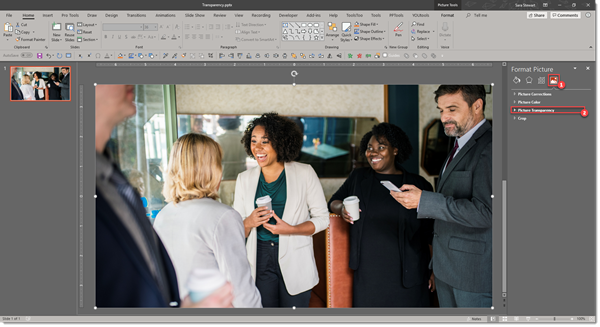 Until recently, pictures in PowerPoint didn’t have a transparency setting for photo/raster images. Transparency could be adjusted on shapes, and for creative presentation designers, a shape fill could be set to be a photo, which would then let the transparency to be adjusted (lots of work, but a hack solution!). 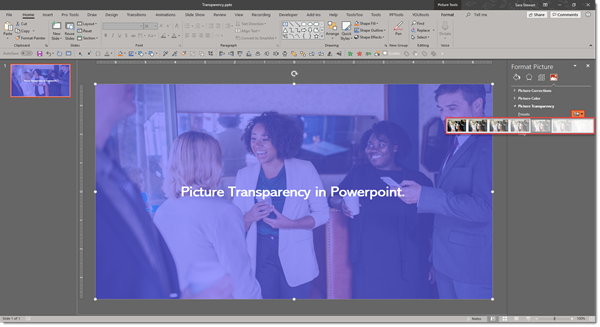 As of late October 2018, image transparency is a real thing in PowerPoint Office 365 version! When an image is selected, there is a new TRANSPARENCY tool on the ribbon. 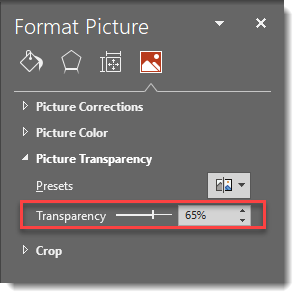 On the format pane, the Transparency options allow the amount of transparency to be adjusted. Go to Format Picture > Picture > Picture Transparency. 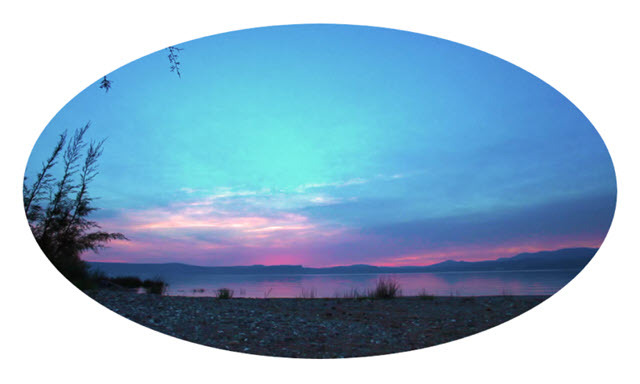 Here is an image on a blue background slide. First it is the default opaque (0% transparency) and then semi-transparent (30% transparency). 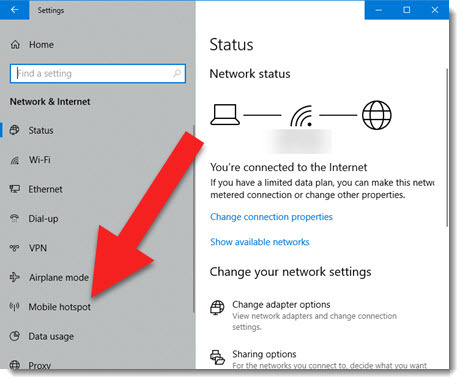 The ability to turn a Windows 10 computers into a WiFi hotspot by sharing its internet connection, either wired or wireless!, is an amazingly useful feature. It requires some advance setup, then it is always available. Now on any device (Windows, Mac, phone, tablet, etc.) 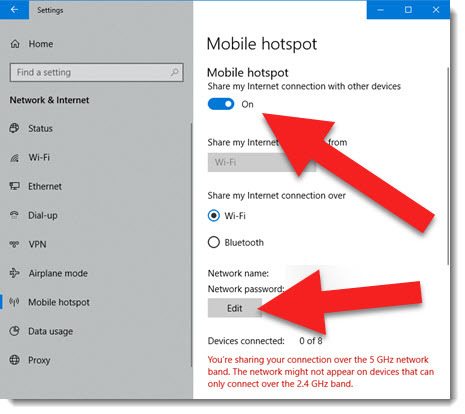 look for you WiFi SSD and connect! 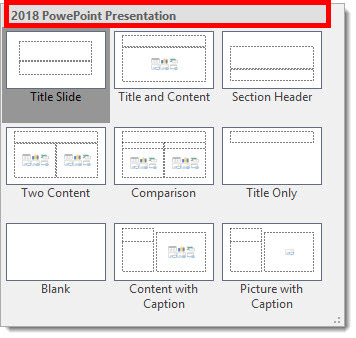 Earlier this month, was how to use PowerPoint’s Change Shape tool. Using the same tool, videos are not limited to rectangles! Essentially the Change Shape for videos crops any video to a new shape. First, insert your video and select it. 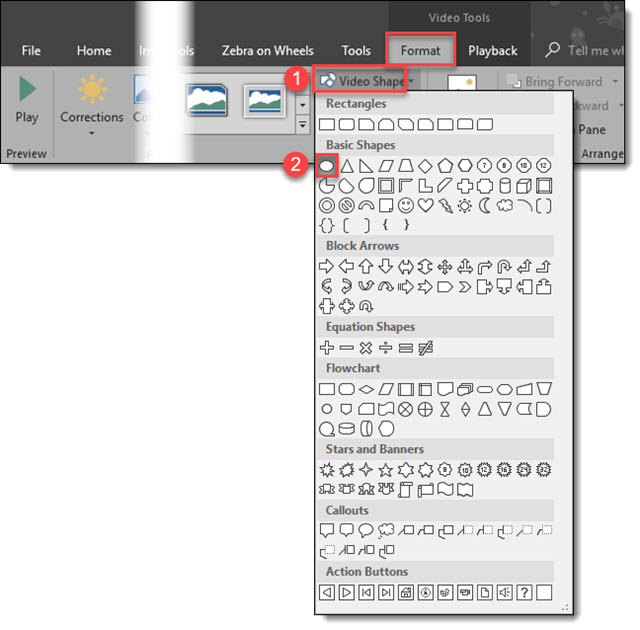 Go to Video Tools > Format Tab, click Video Shape > Oval (or other desired shape). The video is now cropped to an Oval. 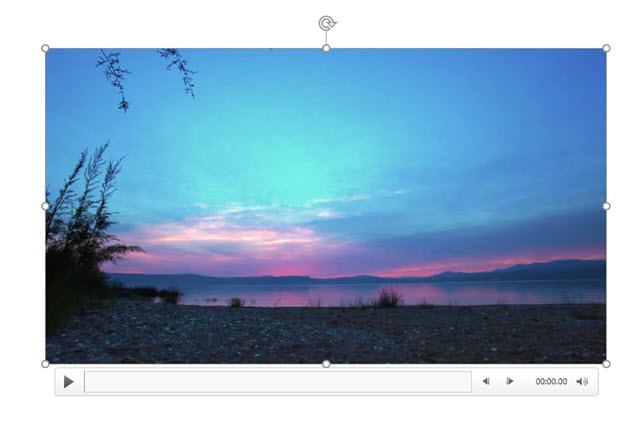 The same crop tool functionality used on images works on videos. 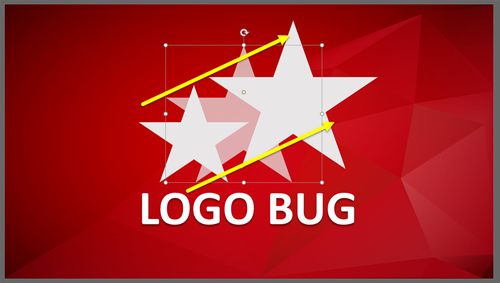 By default, the Video Shape tool crops to the existing rectangle aspect ratio. 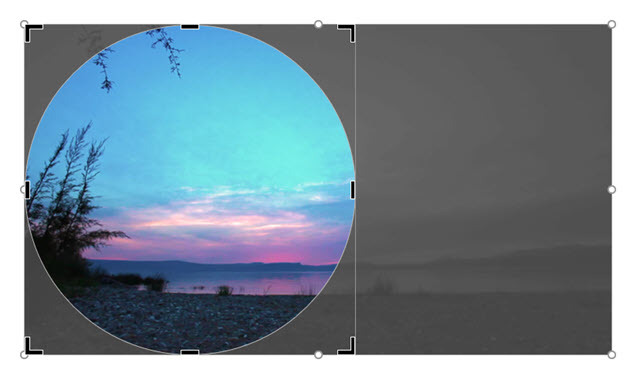 To make the video playback a perfect circle, use the crop tool to manually change the aspect ratio to 1:1. Note: adjust the viewable area of the video by repositioning the video in the cropped area while the crop tool is selected. The video is now a circle, or a star, a heart, or any other shape in the Video Shape library! Whichever shape you select, the video will export and play in that format. When it comes to design, there are few things worse than seeing distorted shapes, pictures, and text. In presentations, we often see distorted headshots, picture place holders, callout shapes and more. 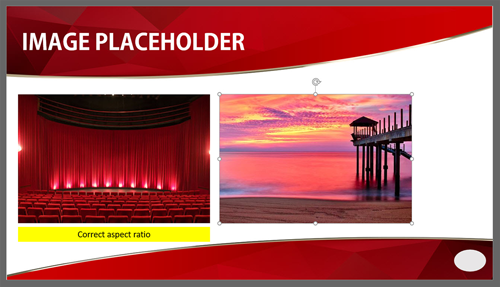 Powerpoint’s “Lock Aspect Ratio” feature helps ease the task of resizing any shape, photo, or placeholder. 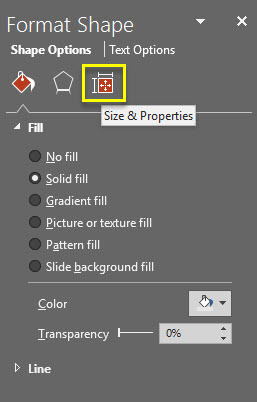 Right click on the object you wish to resize and select “format shape.” This will open the right format shape panel, select the size & properties tab. 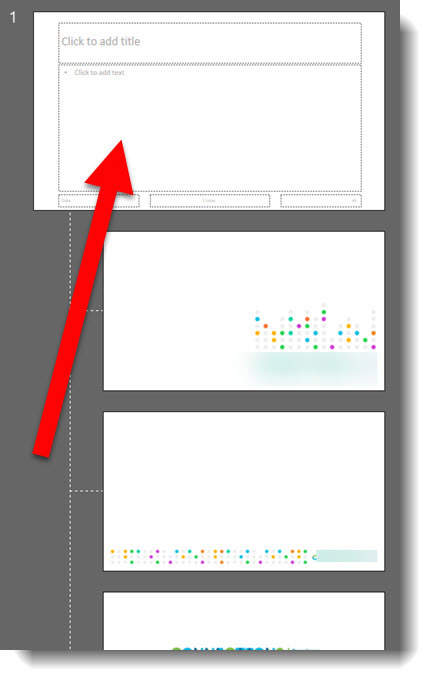 Under the size dropdown, check the Lock aspect ratio box. You now can grab any of the four corners of the bounding box and resize without any distortion. Previously, this was only achievable by holding down alt. Now, drag and resize your shape to your desired size. 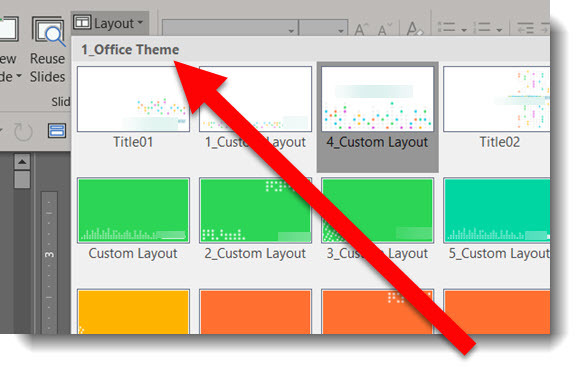 Text boxes in PowerPoint are like mini-word documents. Each one has its own margins, tabs and formatting. 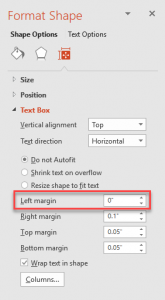 The text box formatting options (margins, tabs, line spacing, etc.) for each text box can be modified in the Format Shape dialog. 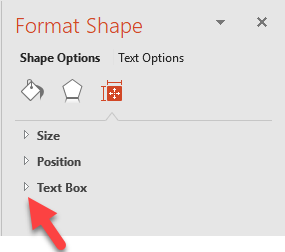 Select a text box > FORMAT > open the FORMAT SHAPE pane > TEXT OPTIONS > TEXT BOX. Or right-click any text box and select FORMAT TEXT EFFECTS > TEXT BOX. 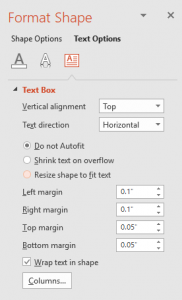 Just one example of where modifying a text boxes internal margins can help the visual layout is when a design needs the text to flush align with other objects, vertically and/or horizontally, the text box margins interfere with the results. 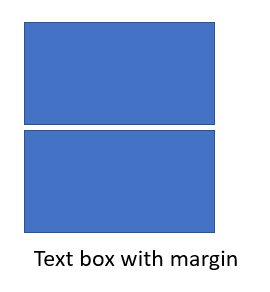 For this example, it is making the 3 objects, 2 boxes and 1 text box, all with the ALIGN LEFT tool, vs. manually adjusting the position of the text box so the text inside it is visually aligned with the objects above it. 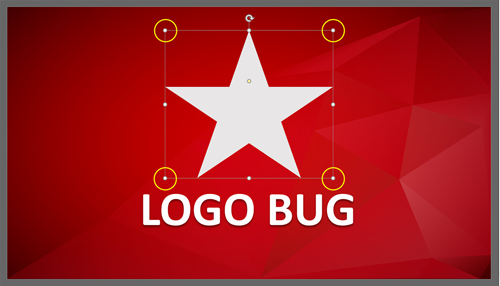 The left edge of all three align, but visually the text is indented, but they are actually aligned to the left edge. 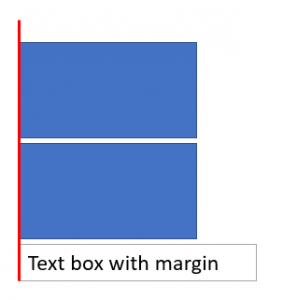 Instead of manually moving the text box left to visually align the text with the two boxes, adjust the text box margins – set the left margin to zero. To illustrate, here is are two text boxes. They have identical formatting, but the lower one has a solid fill to show the text margin. The top text box has a zero left margin. The bottom text box has the default .1″ inset margin pushing the text away from the true left edge. To make the text align to the left edge, go to the Format Tab and click on the small arrow under the text portion for the FORMAT SHAPE menu. 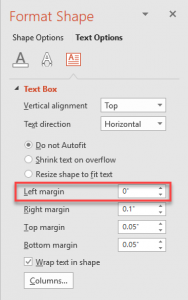 Select TEXT BOX in the left column and on the right in the INTERNAL MARGIN section change the LEFT to “O”. The text now aligns flush to the left edge. 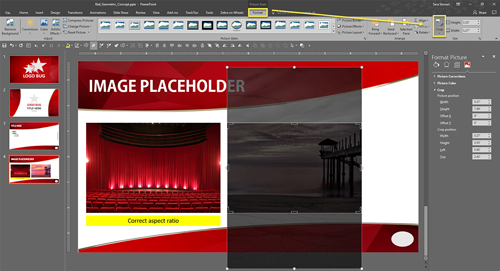 At TLC Creative we are constantly working with text box internal margin settings to create visual layouts. 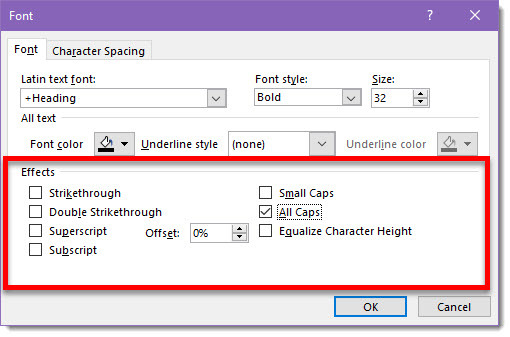 It is easier if each text box is visualized as a mini-Word document with it’s own settings.